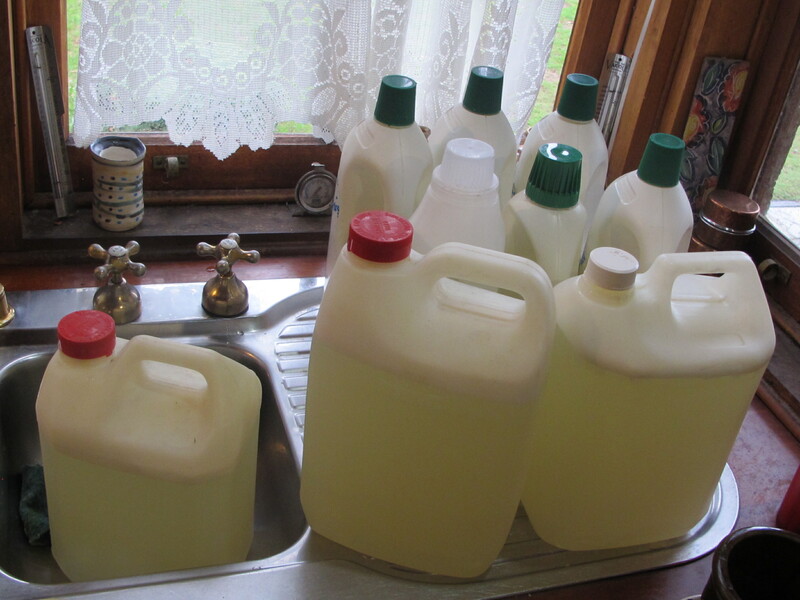 One job that crops up 2 or 3 times a year is the making of liquid soap ‘gell’ for washing clothes. The Bright and Shiny King of Household Management is on to it and is well prepared. She has been doing this continuously since the early 80’s. Miss ‘Sunlight’ uses one cake of cheap generic brand laundry soap, which is still made in Australia surprisingly. 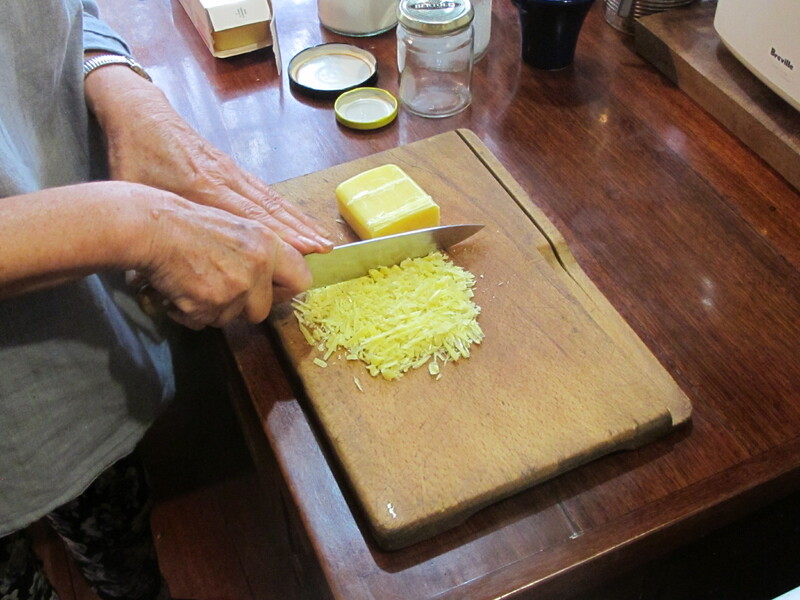 The Soap Queen cuts the block of soap into thin slices. about 1/3 is used in each batch. This amount of shredded soap ‘flakes’ is dissolved in a couple of litres of boiling water. We usually do it when the wood fired stove is lit, so as not to waste energy. 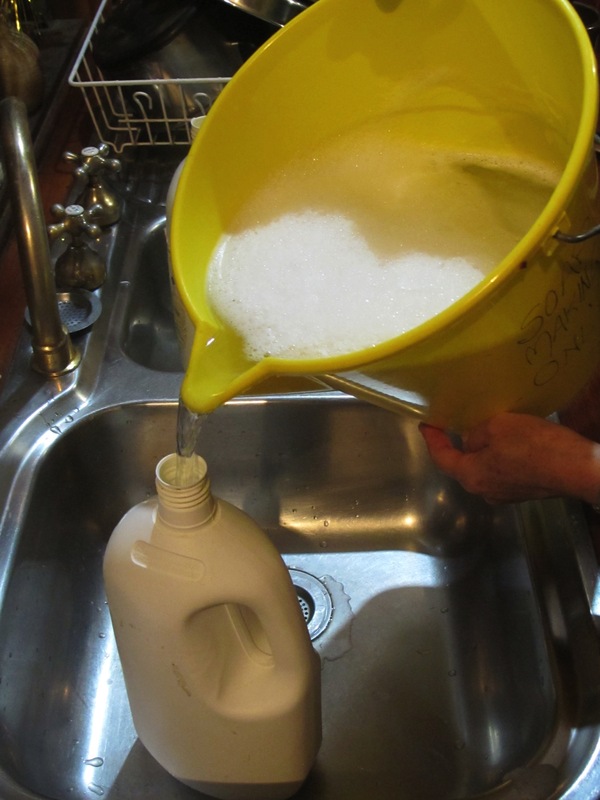 The dissolved soap concentrate is then mixed with cold water up to about 7 or 8 litres in a bucket. If you want to add some fragrance, this is the time to do it. 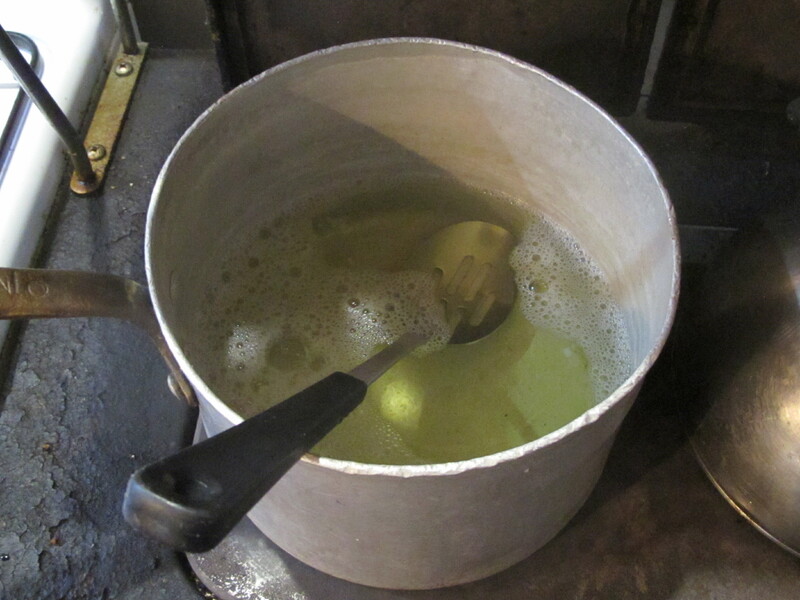 The diluted mixture is poured into flagons for long-term storage under the laundry sink. This is repeated, this is repeated, this is repeated, 3 times, until the whole block of soap is used up and all the available recycled plastic bottles and flagons are full, about 20 litres in all. This amount of soap ‘glug’ usually last us about 4 months for all our clothes washing needs. She is my Sunlight, my only Sunlight, She makes me happy when clothes are grey – by washing them with home-made soap. We have what is now, a very old, front loading washing machine that uses our own stored solar hot water, instead of electrically heating cold water. This saves energy. The front loading design also uses less water and energy all up. This machine was built in Europe and we have had it for well over 20 years. It’s been exceptionally reliable and paid for itself many times over in all the water and energy that it has saved us. We used to add an equal amount of washing soda crystals to this clothes washing soap mix, but we read that the soda was bad for the soil and the water ways, where it inevitably ends up, so we cut it out from the recipe some years ago and haven’t noticed any difference in the outcome of our washing. 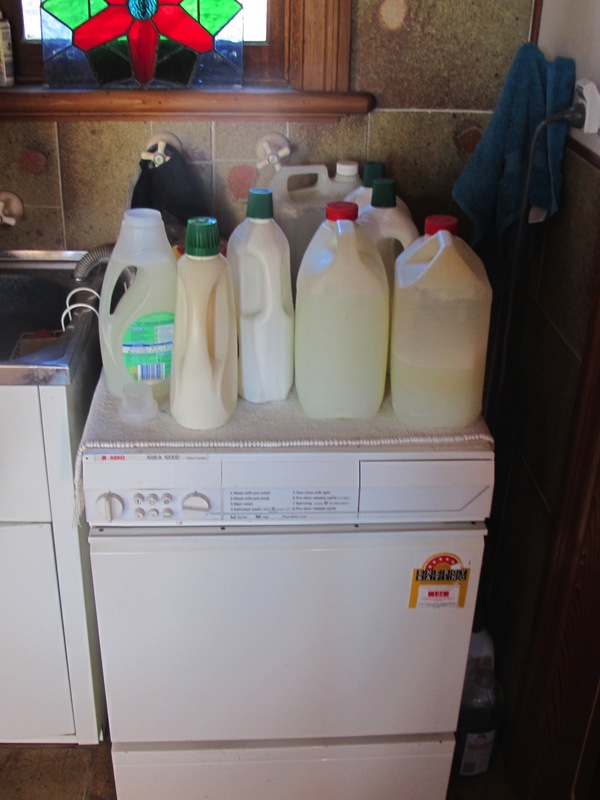 The reason that we started to make our own washing soap ‘glug’, was after we read a shocking report on the build-up of phosphates in the water system and the blooms of algae that occurred in some of our rivers during the summer ‘dry’ back then. We decided then that we ought to do something ourselves to take control of our part of the system. So we stopped buying phosphate detergents. We’ve rarely needed to use much detergent since then. We still buy the occasional bottle of ‘green’ detergent. It claims to very environmentally friendly, but all advertising does. It’s sodium Laurel sulphate based. a small compromise. We only use it for the very odd occasion when I need to wash my very dirty work clothes, especially if they have oil or grease on them. But this is fairly rare. I always wash the dishes using the same laundry soap, which I scrub against a green dish scourer pad and then scrub the dirty dishes with that scourer. The soap cuts the oils from cooking with no trouble and because all our pots and pans are beautiful objects in their own right, it’s really good to get to handle each item as it gets washed, rinsed and placed in the drainer. Half of all the ceramic pots that we use are things that we have bought from other potters on our travels. Miss ‘Sunlight’, The Soap Queen, rotates the pots in the kitchen, so that it is always interesting to use newly recycled pots that we haven’t used for a while. We don’t own a dish washer machine. I’m not too sure about the strong detergents that they use in those machines. Anything that can slowly dissolve plastic cups and strip the 24 carat gold lustre off ceramics, can’t be too good for the environment? As all our water is recycled through the soil on our own block of land here. I don’t want that kind of stuff in my orchard, growing my fruit. Best not to get involved. Leave it on the shelf, in the shop. 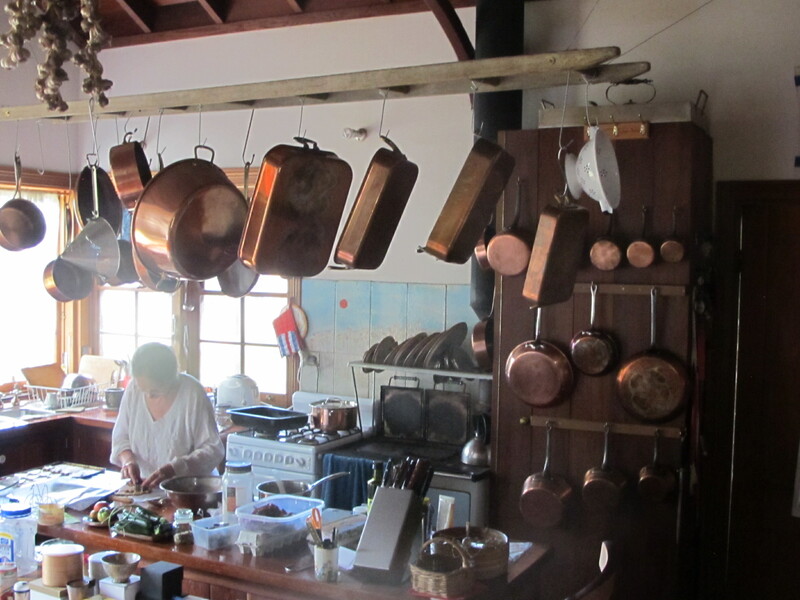 All the kitchen cookware has been collected over many years on our travels and most of it is tinned copper or stainless/copper combination. They are lovely things to handle and use. I wash these with the same soapy plastic scourer pad and after rinsing I give them and extra wash-over with a piece of used lemon rind with some salt on it. This keeps them always looking new and shiny. Soap is all that is needed to dissolve the grease and oils that we use in cooking. Mind you, we don’t tend to eat very many greasy things. 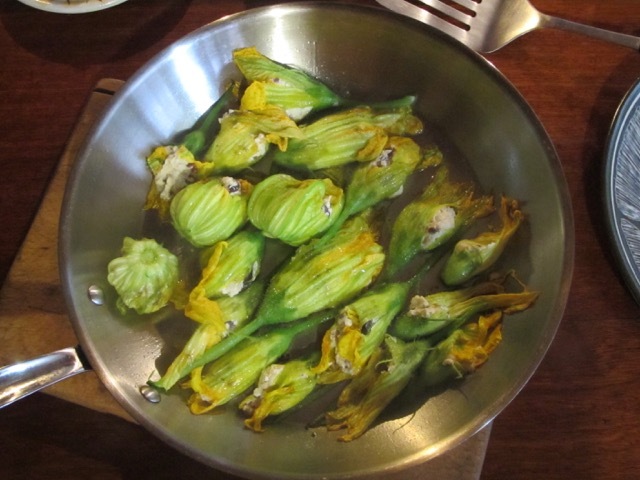 Most of our cooking is by streaming with just a little use of olive oil to stop things sticking too much. 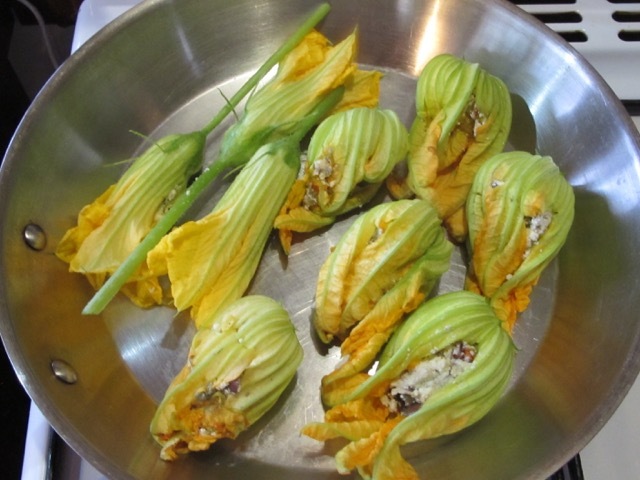 For stuffing zucchini flowers, the ricotta has to be well drained and pressed. The rubbish that is sold as ricotta in tubs the supermarket is all water. Artisanal ricotta may be a bit more expensive, but it’s got 50% more cheese solids in it and less water. If you try to use the cheaper commercial tub stuff it drains out of the flowers in a big wet watery mess. It still tastes OK, but it doesn’t fill me with joy to see my beautiful flowers all turn to ‘sog’ in a pool of cheesy water. No whey! 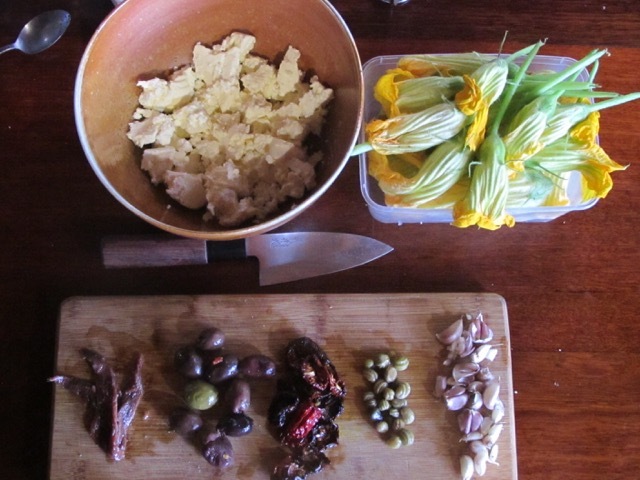 I’ve been using our own preserved nasturtium seed, masquerading as imitation capers, our own dried tomatoes and this season’s fresh, but small garlic, local olives and some anchovies. This time I used a few pickled green French beans instead of a gherkin and I’ve been adding a little bit of firm blue cheese in the recent mixes. 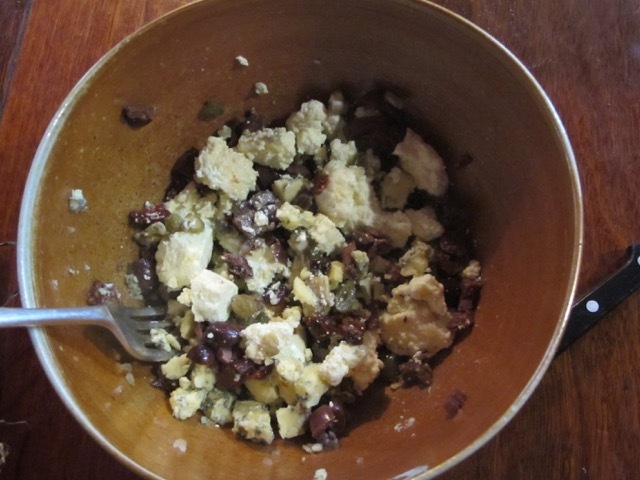 It makes a lovely combination of flavours in the savoury cheese filling. I don’t use much of it, but just enough to give it a hint of spice to the otherwise rather bland curd filling. 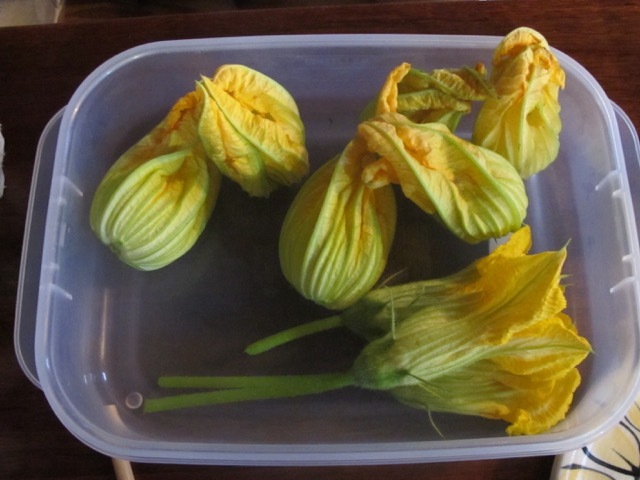 They don’t just taste good, but the flowers look lovely too. 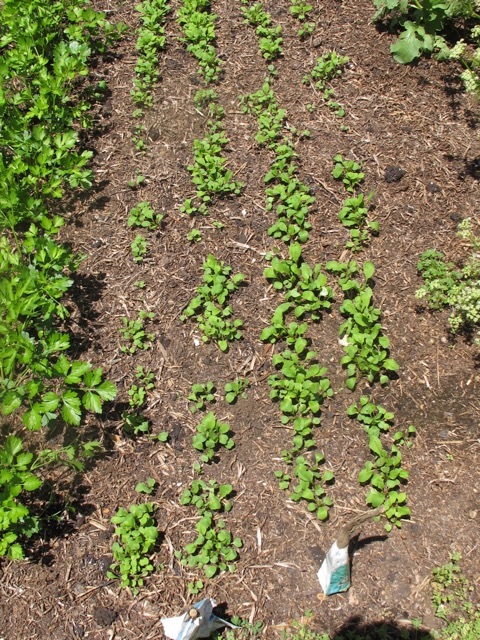 All the seeds that I planted in the past few weeks are all up now and putting on some size with all this rain that we have been having combined with the warm weather, it has made for good growing conditions. On the other hand, it has been so wet that I haven’t bothered to mill any porcelain stones into slip as yet, as the slip wouldn’t have dried at all on the drying bed. I’m not set up for drying clay in the rain like they are at Onta in Kyushu. See earlier blog. I was able to make good use of all the indoor time by building 2 kilns for my customers and getting everything done right on schedule. So I’m pleased. 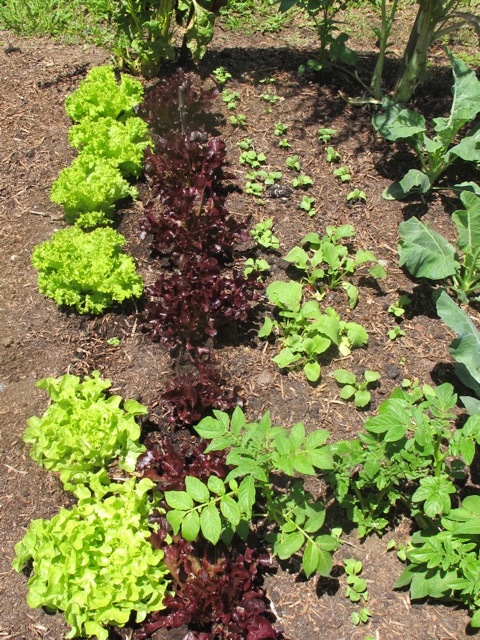 The garden looks good and is producing all our summer fruit and vegetable needs. We are already bottling our excesses. The bit of flat dirt that we laughingly call the ‘lawn’, is actually green in summer. That is something that we haven’t seen for quite a few years and we have plenty of work lined up.